The problem was already in Jerez? Doesn't seem like a very good software. Microsoft Dynamics like it says in the car? Bunch of blue screens probably. -Yes, it’s frustrating and no driver wants to hang around a race track with nothing to do. We had a gearbox issue and it took the crew a long time to fix it. Sometimes these things take a long time and that’s pretty normal when you have a test. The team were very busy working on the car, but there’s not much you can do as a driver when this happens and it’s not great to watch the other cars put lots of laps on the board. No Ego, no Bulls hit - We could do with a few more drivers like that. Someone pointed out Kimi's biggest strength is his mind management. He doesn't concern himself with issues outside his control, he just does the best he can with what's in front of him. Ideal sports competitor in other words. He's obviously a very good driver as well, and he does it without pushing the boundaries of acceptability. Like swerving into other cars and/or running them off the track. What I like about him, is that he says very little, but when he does open his mouth everyone pays maximum attention. Proof that less really is more. Those interviewers ask questions like that because they haven't got the brains to think of anything smarter to ask. No wonder Kimi can't be bothered with PR and press conferences. I think most normal people would get cheesed off with it very quickly. Other drivers play the game because they like the attention. specifically the line .. "We don't have the budget, but if we get it right and can be consistent and reliable then we probably can put ourselves in a position where at least we do have a chance". im sure this could be said about other drivers too but if recent reports are right kimi is worth a couple of hundred million yes? now maybe im looking at it wrong but if these drivers are only there to win would it not be worth splashing a little of that fortune on the team giving a greater chance of reaching the title again? if i had a bank balance like that i would happily speculate 20m on my side of the garage to increase my chances of accumulating another world title trophy! He's there to drive the car, not run the team, or be a pay driver. I feel sure if he felt he could make a difference in other ways he'd do something about it, but really that's no-ones business apart from Kim and Lotus themselves. In any case, sometimes pouring money into an organisation simply makes things worse. Because it tends to hide defects that need solving in other ways. sometimes , say pouring money in to a team where the drivers are a weak link wouldn't be as effective but lotus have the drivers just apparently not the budget. as i said just my way of looking at it and im in no way singling kimi out here its just his comments that sparked the thought in my job i will happily put myself out financially at times for the good of "the team" and my own accomplishments or "trophies" . that said i bet they made a fortune in t shirt sales off the back of kimi's radio messages so he's doing his bit. Exactly. F1 Examples: Toyota, Honda. I bet they made a fortune in t shirt sales off the back of kimi's radio messages so he's doing his bit. I understood Kimi had them made at his own expense as a gift to the Lotus staff and their families. They did sell them, I have one. Exactly the same (looking, at atleast) as the one sent to Lotus' group. i salute you on that purchase! how much was it? The incredible interest in Kimi Räikkönen. When Räikkönen had his first international media-event on Thursday evening over 100 reporters and photographers from the whole world's media were present. No other driver was crowded the same way. Räikkönen attracts media like fly-paper. There is something strange and fascinating in Räikkönen's persona, that for a Finn is sometimes difficult to understand. Räikkönen talks silently and his answers are the usual F1-jargon, yet they interest. A driver like this is a gold nugget to the team. Not to talk about Lotus, who thanks to Räikkönen's victory in Abu Dhabi got new sponsors. According to rumours on the paddock Lotus still owes the victory-bonuses to Räikkönen, but they don't talk about it. Räikkönen isn't troubled over it - at least yet - because he doesn't need any pocket change. Räikkönen was calm and professional in Jerez although he had drama in his own private life. Thanks for that Appletree, have always thought Kimi special from the very first interview I heard him give when he entered F1. Hope 2013 will be a great season for him. Last edited by SwSpeed on Sun Feb 24, 2013 8:03 am, edited 1 time in total. I bought a bundle with a hoodie, beanie (which is awesome!) and the T-shirt, bundled price 80€ if I remember correctly. When is the Moscow race, what's the format and where is it being shown? Can't seem to find any info anywhere! Is it me or is Kimi smoking a cigarette? yes, he is. But thats an old picture. So Kimi came second and Pic third in the Race of Stars. Some local bloke won it. Awesome driver and awesome car (when it was working). That Mclaren sounds like a monster when Kimi starts his lap! Kimi Räikkönen and Charles Pic took part in Russian All Stars -race as invited guests to race with Russian racing drivers on an ice-track in Moscow. 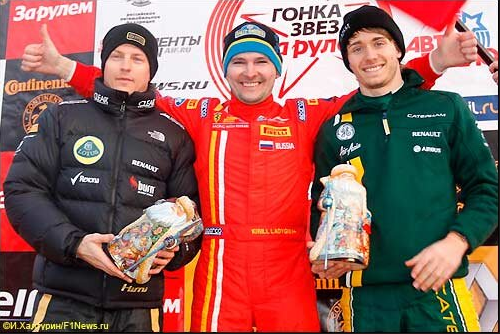 Although the visit on Saturday was a PR-event for Räikkönen and Pic, the Russian champions were racing seriously. Russian's oldest car-magazine "Za Ruljom" (Behind the steering wheel) arranges this traditional race. They also have a tradition of inviting international stars to Moscow. Because Renault sponsors the event they sent Räikkönen and Pic there. Räikkönen and Pic drove VIP-guests and media reporters around the track in a small Renault Logan. In between races the F1-drivers raced each other and Räikkönen was much more faster than Pic, as was expected too. Ladygin, who is a real professional, beat Pic easily but the situation with Räikkönen was completely different. Kimi battled until the end and was twice just about to overtake Ladygin. However the Russian pilot managed to maintain his position to the finish line. Any videos of the Ice Race event..? Here's one, not much driving though. Romain tests Thursday and Friday, Kimi tests Saturday and Sunday. Weather forecast not great in Barcelona. Some breaking news courtesy of @noblef1. Kimi Raikkonen is ill and will be replaced by Lotus reserve driver Davide Valsecchi this morning. Romain Grosjean, who finished his pre-season programme yesterday, has been told to turn around and come back to the track. He is due at Barcelona this afternoon. Oh dear. I hope will be alright tomorrow. Seems like Kimi's down with an upset tummy. Hopefully he should be alright to drive tomorrow. Of course it is, why should he party with HRH QE II? Two days ago I had a dream with Kimi in it, he had a big crash and was injured. Now he's sick. Scary.